Last week, we hosted two managers from cacao co-ops we work with in Peru to source chocolate for our new Organic Chocolate Chips and for our line of Organic Candy Bars. Hildebrando Cárdenas Salazar from Oro Verde co-op and David Contreras from ACOPAGRO co-op visited our headquarters in Massachusetts to learn more about Equal Exchange, meet some of our store accounts, and work on 2014 planning for our USAID grant project with the two co-ops. Since our founding in 1986, Equal Exchange has worked with small-scale farmers, because we believe small farmer co-operatives are the heart and soul of Fair Trade. Though Equal Exchange began as a coffee company, our commitment to small farmers has remained foundational, even as our company and product lines have grown. For over a decade, we've partnered with farmer co-ops in Latin America to bring you high quality, fairly traded chocolates. Meet Ed Bachleda, organizer of Equal Exchange sales at St. Catherine of Sienna church in Portage, Mich. I recently got to meet Ed and see firsthand how he organizes his inventory, and schedules volunteers to sell Equal Exchange fairly traded products after four masses twice each month. Looking for a late afternoon sweet craving? After dinner dessert? What if you could satisfy your sweet tooth guilt free, support small scale farmers AND actually be healthy. Is it possible? Equal Exchange has just the chocolate bar for you, in 9 alluring varieties. Every Friday morning as you sip your (Equal Exchange!) coffee and settle into your day, something remarkable is happening. 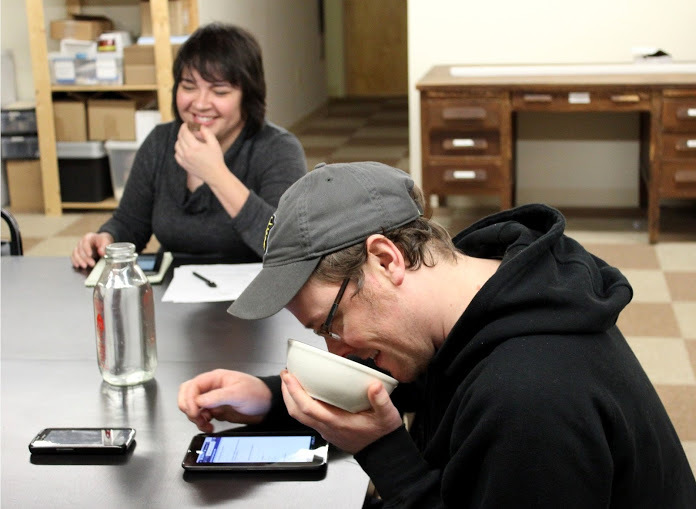 Promptly at 10 a.m., highly trained tasters are assembling in a quiet corner of the Quality Control lab at Equal Exchange for an hour of intense product evaluation. This is the Tasting Panel, a hand-picked group of the best mouths at Equal Exchange. Ask the Dietitian: How Do I Avoid Overeating During the Holidays? With the holidays quickly approaching, I always get questions about how to prepare for the season to avoid weight gain or overdoing it when all the tempting, delectable treats appear on the scene. I am a huge sucker for my grandma's fresh baked rolls and brownies cooked using Equal Exchange dark chocolate. Luckily, I have found that these tasty delights can fit into a healthy, balanced diet, without guilt. How? Everything in moderation! What is moderation? Let's find out. Costumes, candy, haunted houses, apple cider and the crisp fall air! There's much to love about Halloween. But then, there are other aspects that can come along with it"”children on candy-induced sugar highs, cavities, and obesity. The bad news: candy and sweets eaten in excess can lead to all of these realities. The good news: you and your family can still enjoy Halloween and not wake up the next day with cavities, hundreds of calories, and a sugar hangover.